Pain can be a real pain, and it can also be something altogether different, if we will but meet it, rather than turning away from it. This book describes how to end our suffering by entering our pain, step by conscious step, finding ever-increasing freedom in so doing. Pain comes with Life, often inevitably so, and can serve Life if we don’t turn it into suffering — meaning that we don’t make a self-binding story out of it starring us in the victim role — but instead turn toward and enter it. And how do we do this? We name our pain; we turn toward it; we enter it; we get intimate with all of its qualities — its directionality, texture, temperature, color, density, shape — going into it until we reach its heart. Eventually we emerge; our pain may not be gone, but we now have a very different relationship with it, a relationship that serves our healing and awakening. The degree to which we turn our pain into suffering is the degree to which we obstruct our own healing. Suffering keeps pain in the dark. When we are busy suffering, we are without healthy detachment, being removed from the naked reality of our pain — our attention being far more focused on our storyline than on the nonconceptual rawness of our pain — but not removed in a way that permits us to focus more clearly on what is actually going on. To work effectively with our suffering, we need both to stand apart from its script — so as to more clearly bring it into focus — and to cease distancing ourselves from our pain. As we become more intimate with our pain, we find that we are less and less troubled by it, until our pain is but grace, however fierce. Meeting The Dragon is all about cultivating such intimacy. Meeting the Dragon is a courageous and poetic invitation to wholeness, brilliantly conveying the inextricable link between entering our pain and embodying our ultimate expansion. Robert guides us into the dragon’s lair, artfully showing us the way through murky caverns, bringing us face to face with our own dragons. Once there, we receive the most valuable teaching of all — that the dragon’s fire is ultimately indistinguishable from the treasure it protects, that the gatekeeper is actually the gateway. Right there in the heart of our pain are the very lessons that we most need to grow. What a beautiful thing to remember! I highly recommend this wondrous book. 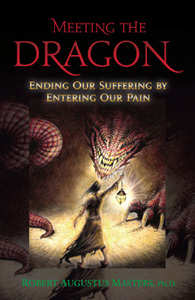 Dr. Masters offers us a sensible path of empowerment with whatever dragons we must face. He outlines a gentle yet dynamic approach leading the reader step by step away from suffering towards a fuller sense of personal authority and dignity. He has crafted a very helpful contribution to the field of working with pain, which will be of benefit to many. The language is passionate, evocative, and richly poetic. The message is wise and profound: pain is an inevitable part of human life, but suffering is optional. By entering your pain, really experiencing it, getting to know it — ceasing to resist it, avoid it, or compensate for it, Masters suggests you can discover in it the seeds of a profound shift of consciousness. Turning toward our pain is an act of radical caring — and not just for ourselves, because we are then no longer fueling or supporting the turning-away-from-pain that has addicted so many of us to whatever keeps or seems to keep us removed not only from our pain, but also from the pain of others. In turning toward our pain, we are also, however indirectly or slightly, turning toward others’ pain (in both personal and collective contexts), one result of which is that our compassion for others not only deepens but also widens, and our interconnectedness and intimacy with all that is becomes much more than just a belief or intellectual construct. Turning toward our pain is about bringing into our heart all that we have rejected in ourselves, all that we have ostracized, disowned, neglected, bypassed, shunned, excommunicated, or otherwise deemed as unworthy in ourselves. Our heart somehow has room for it all. In turning toward our pain, we are also turning toward our avoidance of our pain, allowing ourselves to see it for what it is, even as we feel its pull and hear its siren call, its promises of pleasurable release, its advertisements for itself. Seeing this avoidance with any consistent clarity may be very difficult at first, as our distractions again and again seductively approach us, but it helps to know that they will thus show up — more often than not dressed to kill or thrill — and that we are capable of naming the pain from which they are promising to remove us. If, before reaching for your favorite fix, you simply ask yourself what you are actually feeling besides your urge to thus reach, and you then turn toward that feeling — which is probably painful, and tied in with certain strands of your personal history — and stay with that feeling, breathing it in, letting yourself fully feel it, you increase the odds that you won’t significantly distract yourself from your pain (including by converting it to suffering). In naming our pain, we may still be turned away from it or be at an angle to it, but when we turn toward our pain, rotating until we are facing it squarely, we are in full frontal contact with it, preparing ourselves to step forward by deepening our stand. And deepen it we must, or we will be uprooted all too easily. As we strengthen and stabilize our stand, getting more used to facing our pain, we may notice that our longing to be truly free is, however slightly or sporadically, getting stronger than our longing to distract ourselves from our pain. We are now facing the dragon, perhaps feeling its heat and meaty threat as we open ourselves to its presence, breathing in its energies — but not so much as to overwhelm ourselves — and then breathing out in a manner that settles and further anchors us. We may feel like distracting ourselves, but we have too much at stake, and know that we have too much at stake, to postpone, obstruct, or otherwise turn away from our pain. So we stay put, but not rigidly. If we find it too difficult to stand where we are, we step back a bit, and then root ourselves there. Moving back from the fire is fine so long as we keep facing it. Beware of the ambition that would have you move forward prematurely. Beware of playing the hero, the dragon slayer, the impeccable warrior. Do not take the dragon lightly. It won’t lie down and roll over just because of your dreams of glory and breakthrough. What matters is that you take an open-eyed stand and do your best not to wander away from it. You may sway in the wind, but do not let it turn you away from your pain. Study the dragon as closely as you can from where you are. It is in sight. See it both in its totality and in particular ways: its position, its shape, its colors, its bulk, its movements, its odor, its teeth. And see how you have tended to treat it. Don’t try to outstare the dragon, though. If you lock eyes with it for too long, you may lose touch with yourself to the point where you lose your footing. Better to look with clear focus for a little while, then look away for a bit, then look back at it again. Give yourself enough time to acclimatize; facing your pain — which includes facing your aversion to it — so directly may be a very new experience for you. If your pain seems monstrous, it may be because you have treated it as such, keeping it from loving human contact so long that it has taken up residence in less-than-human forms. As you stand your ground, cultivate a second-person relationship with your pain; before, you’ve probably had a first-person approach to it, namely identifying with it, as well as a third-person approach, keeping your pain as an unpleasant or undesirable “it” somewhere in the distance, just as you may have considered your body an “it” somewhere below your “headquarters.” So now bring in a second person approach: instead of relating from your pain, you relate to it. As such, you listen to it, you observe it without disengaging from it, you let yourself sense more than its surface features, you start to get inside it, you choose to be in relationship to it, no matter how alien it might seem. And thus you make the acquaintance of the dragon. And you keep whatever distance you need, deepening your stand, relocating it if you have to, without turning away to any significant degree. If this sounds like something you think you can’t do, think again: to turn toward your pain does not necessarily mean that you remain thus turned all the time! Rather, it means that you turn toward your pain, taking a stand there for long enough to start to get used to facing your pain. Of course you’ll take breaks, sometimes frequent breaks. But so what? So long as you keep turning toward your pain, and practice staying there, rooted as best you can, it won’t really matter that you weren’t able to always stay with it for very long. Acclimatization takes time. Turning toward our pain is a step toward real freedom. Turn as slowly as you need to, but do turn. You are worth it. So are we.